Disney-Pixar’s “Coco,” which celebrates the importance of family bonds, delights guests at Epcot during this holiday season. 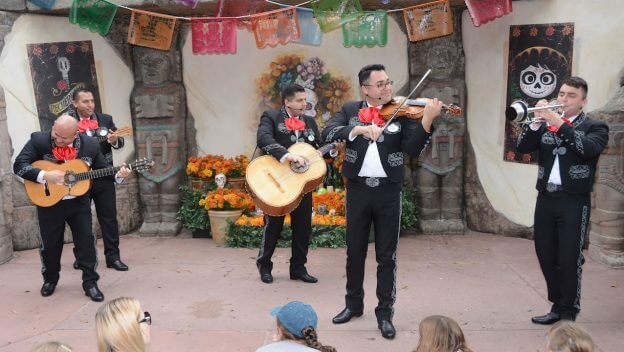 Guests visiting during Epcot International Festival of the Holidays can also enjoy Las Posadas, which features colorful dancers and performers from Mariachi Cobre as they celebrate the holiday traditions of Mexico. Later this winter, Mexico Folk Art Gallery will feature an interactive exhibit and dioramas displaying scenes from the film. Mexico Folk Art Gallery currently hosts a collection of “Dia de los Muertos” artwork. In theaters now, “Coco” tells the story of Miguel, who longs to be a musician despite his family’s generations-old ban on music. A few magical mishaps on Dia de los Muertos send Miguel to the Land of the Dead, where he teams up with trickster skeleton Hector to track down his musical idol, Ernesto de la Cruz. Along with “Coco,” you can catch “Olaf’s Frozen Adventure,” an all-new follow-up to “Frozen” that sees Olaf and Sven searching for the best holiday traditions in Arendelle.